From ground level the grassy field looks to be covered with the kind of plastic sheeting commonly used to shelter intensively farmed fruit and vegetables. But this is no agricultural device: it is an image on the Earth. It is only when the sheet is seen from the aerial view that the image becomes startlingly clear. 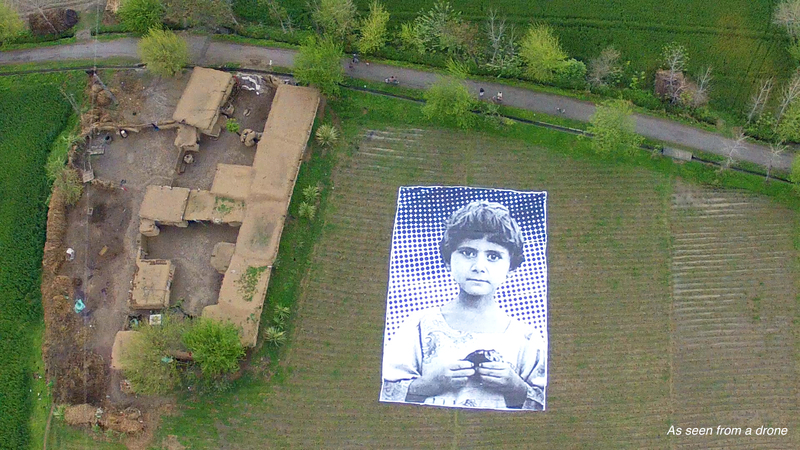 Staring up from this anonymous field in the drone-killing heartland of Khyber Pukhtoonkhwa within the Federally Administered Tribal Areas in Pakistan (known as ‘FATA’), the gigantic image, placed there by a group of French, American and Pakistani political artists, is of a local girl. According to Pakistan’s Foundation for Fundamental Rights, the nameless child lost both her parents and her brother, Syed, as ‘collateral damage’ to a Hellfire missile fired by a US armed drone on August 21st, 2009. As with developments in bombers, satellites and armed helicopters, such a view reminds us of the ever-tightening connection between the act of killing through a weapon system and the use of visual technologies to find a target. As the time between sensing and shooting has reduced with new communications and sensing technologies, so the military obsession, in the parlance, is to ‘compress the kill chain’. The dream here is to move to a world where weapons and imaging systems are so totally integrated that acts of seeing and killing effectively become one and the same. Journalist Alissa Scheller’s infographic depicting the geography of a single day’s operations of U.S. lethal drone operations. Drones linger and annihilate people from above. Sociologists who have studied viewer comments to YouTube footage from drones of the targeting and killing of ‘insurgents’ note a widespread tendency. In keeping with deep traditions in western culture and language, they see their top-down view as one of inherent superiority over the subjugated, less important, and racialised people — or even dehumanised non-people — far beneath the gaze. Most of the 1600 or so comments from viewers addressed in the study inscribed their views — that is the view of the murderous weapon itself — with a sense of moral and all-seeing superiority. “I want, to see for myself that they are dead and dying”, one comment read. “Just for my own satisfaction”. The drone’s eye view plays well on Youtube, as well as in a whole host of militarised video games. This only adds to the ways in which drone killing operates through complex webs of electronic technology. Together, these work to blur weapons systems with entertainment systems. For this reason perhaps, the U.S. Air Force is directly targeting the recruitment of gamers – especially those with experience of home aircraft and drone simulators — as drone pilots. The actual controls used by drone pilots to undertake the killing now sometimes directly mimic the familiar Sony Playstation controls that recruits have been using since early childhood. In response to this, the uncanny power of #NotABugSplat derives from the way it upscales and upturns that most human of all images – the face – in a way that fundamentally upsets the logic of distant, vertical and machinic vision. It questions the surveillance and dehumanisation that the rise of routine drone-killing relies on. More important still is the way the girl’s eyes ‘look back’ vertically towards the distant sensors that support the drone attacks. On seeing the girl’s image on the field, it’s tempting, for a brief moment, to wonder whether its appearance briefly enforces a more symmetrical gaze between targeter and targeted as image of the girls eyes meet digital sensor. Did the image momentarily undermine the normal operation of drones, which, as media scholar Tim Blackman has put it, “are designed to stay in the dark and bring enemies into the light where they can be destroyed”? It is doubtful whether such a chain of events actually occurred, however: once the image was photographed, and those images had gone viral globally, local villagers used the valuable sheeting as building materials. The #NotABugSplat project reveals, along with many other campaigns, the myths that the military and political supporters of ongoing drone wars endlessly repeat. Drone killing, these arguments stress, involves ‘precision’ attacks and ‘targeted killings’. They operate through all-seeing sensing and targeting systems. And they lead to negligible, and justifiable, ‘collateral damage’ – civilian deaths. Certainly, the US use of killer drones is widely celebrated by large sections of the civilian population as a strategy that puts machines at risk in order to save US military personnel. Indeed, Republican congressman Brian Bilbray has even argued that the Predator drone should be seen as an American ‘folk hero.’ “If you could register the Predator for President,” he suggests, “both parties would be trying to endorse it.” Recently, parts of the US military have even urged that medals should be awarded for successful drone pilots. NotaBugSplat, in challenging the myths and euphemisms of drone killing exposes the gaze of the killer drone from above as little more than a racist gaze used in imperial killing. The image emphasises, above all, how the racist mechanisms through which imperial power constructs humans to be of differential value between a notional ‘us’ in the ‘homeland’ and a threatening and racialised enemy — a ‘them’ — have been switched through drone killing from a largely horizontal to a vertical frame (although one organised though satellites, communications systems and military technologies that are horizontally organised across continental scales). A similar process can be seen in Israel’s switch from a permanent military occupation of Gaza to a policy of dominating the area from above through drone surveillance and strikes. Whilst it is difficult in this case to disentangle drone strikes from assaults by artillery, helicopters and warplanes, the Gazan human rights group al-Mezan calculates that drone strikes killed at least 760 Gazans between 2006 and 2012. During its 2012 ‘Pillar of Defence’ bombardment of Gaza, 36 of the 162 Palestinians killed died through drone strikes and a further 100 were seriously injured. Of those 36 killed, two-thirds were civilians. In analysing such violence, architectural researcher Eyal Weizman invokes Edward Said’s influential critique of the tradition of western ‘Orientalism’ – the construction of an imaginary, primitive and exotic ‘Other’ in the Middle East and Asia to justify violent western colonialism and militarised control. Since the first attack by a US drone in Yemen in 2002, drones have become the mainstay of both U.S. military air power and of covert strikes by the CIA. 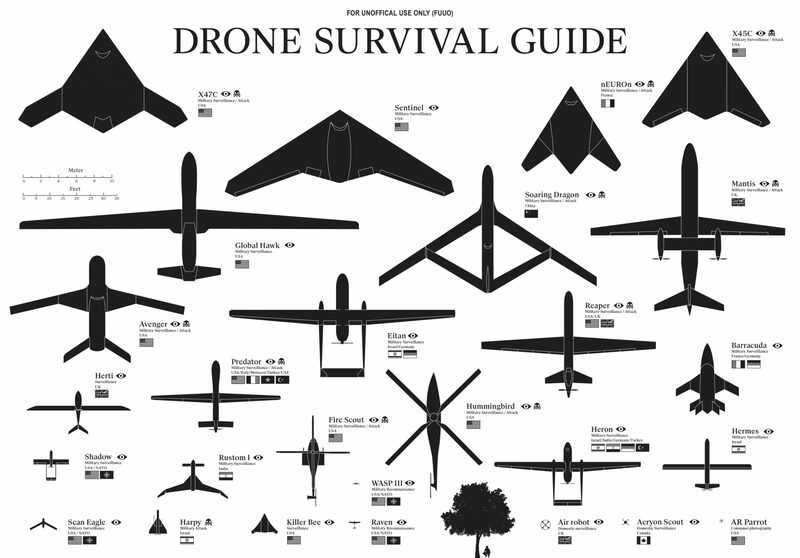 Between 2002 and 2010, the US inventory of drones increased forty-fold, from 167 to around 7000. They now constitute more than 40% of the U.S. military’s entire fleet of aircraft. Following their routine use in Afghanistan, Pakistan, Yemen and Iraq, the US, under Obama’s policy of extending drone operations, now also launches armed drone strikes in Libya, Somalia. 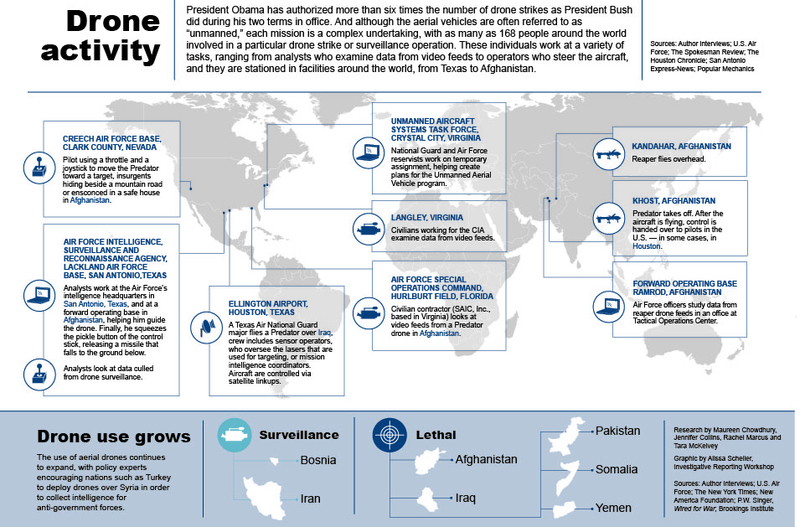 The U.S. also runs routine drone surveillance operations in a wide range of other African and Middle Eastern countries. With extraordinarily broad and vague rules of targeting and engagement, the ‘war on terror’s’ drone-wars have, in effect, turned large parts of the world into a free-fire zone. However, Pakistan, Iraq and Afghanistan overwhelmingly dominate US drone killings. The C.I.A.’s covert drone operations against the northern regions of its notional ally of Pakistan — in breach of every tenet of international law — have been especially controversial. The Bureau for Investigative Journalism has produced robust estimates of the civilian toll of dead and injured over the various periods of the operations. They estimate that, between 2004 and 21 May 2016, out of a total killed by U.S. drone strikes of between 2499 and 4001 in Pakistan, between 424 and 966 were civilians (between 172 and 207 of which were children). The same study calculates that, up to 18 March 2015, CIA drone strikes in Pakistan left between 1,142 and 1,720 civilians were also seriously injured; many were left permanently disabled and impoverished. In Yemen, meanwhile, between 65 and 166 civilians died under similar strikes (out of a total number killed of between 578 and 840,up to 12 October 2016). And in Somalia, between 3 and 10 civilians died out of a total of between 241 and 418 killed by drone strikes (up to 28 September 2016). Finally, official U.S. data admits that drones killed between 2104 and 2756 people in Afghanistan up to 9 October 2016. Many, however, strongly contest official suggestions that this total only included between 90 and 105 civilians. On the back of the massive expansion in the use and deployment of lethal military drones, drone manufacturers have grown enormously in size, profitability and lobbying power. 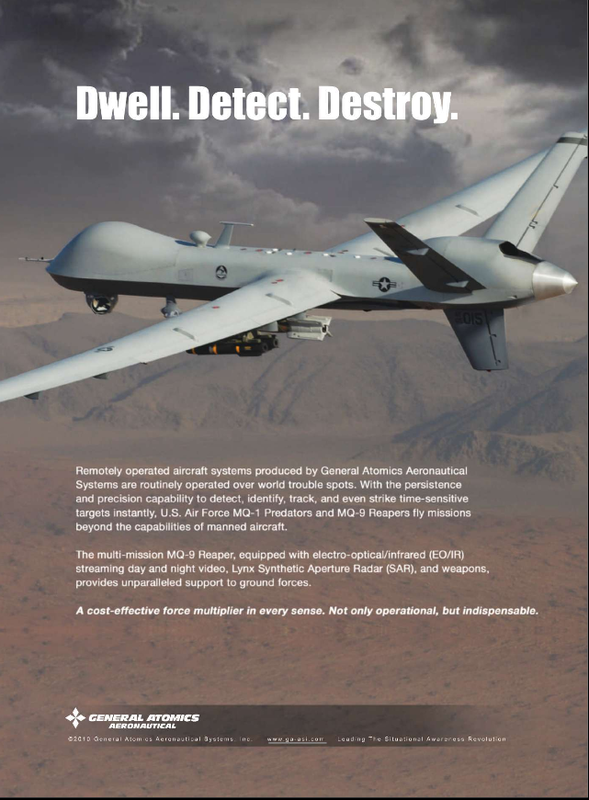 General Atomics Aeronautical Systems — a branch of General Dynamics that manufactures the most widely used ‘Predator’ and ‘Reaper’ drones — is a particularly powerful case. From an annual turnover of only $110m in 2001, rapid growth led this figure to burgeon to $1.8billion by 2012. 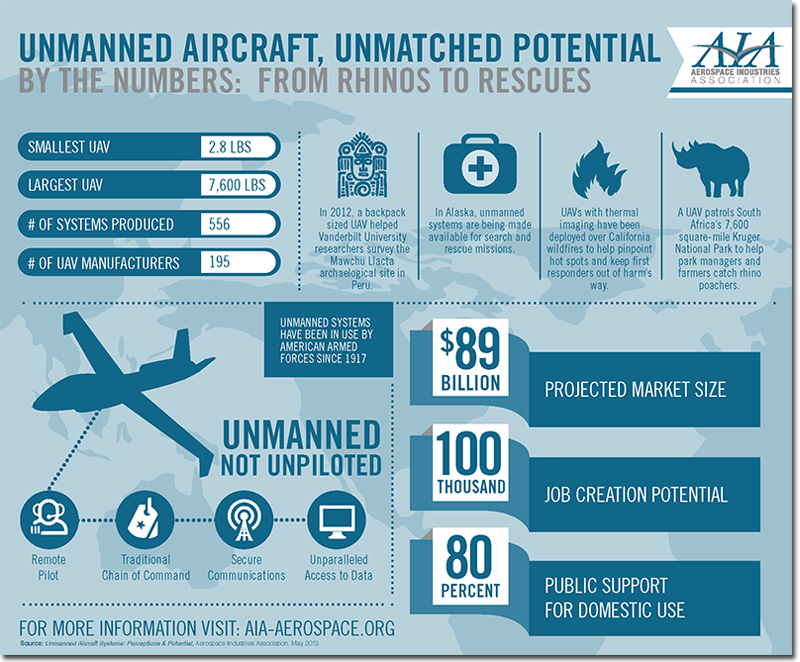 Drones, moreover, are rapidly becoming more sophisticated and capable. As they do so, weapons manufacturers label them using monikers drawn from ancient mythology, names chosen deliberately to add to the sense that they are murderous and all-seeing cyborg-like monsters loitering far above. Beyond the now-familiar ‘Predator’ and ‘Reaper, for example, DARPA, the US military research agency, is building a drone with 92 cameras called Argus after the mythic all-seeing servant in Greek mythology with a hundred eyes. The Sierra Nevada Corporation, meanwhile, make a system called Gorgon Stare, named after the female figure in Greek mythology with hair of live snakes who turned those who looked on her to stone. Aimed at surveilling whole cities, to build up patterns of supposedly ‘normal’ life against which the ‘abnormal activities of ‘targets’ might be identified, the company claims that the system can completely surveil a four kilometre radius. The system even has its own motto: motto oculus semper vigilans (“an always watchful eye”). Understanding the impacts of living in Pakistan, Afghanistan, or elsewhere, under permanent system drone surveillance – as well as the possibility of being killed or maimed at any moment — is not easy. Few journalists or human rights groups venture to the places where drone strikes occur; even fewer manage to interview locals and relatives of victims. Instead, the perspectives, including those of sites like YouTube, remain almost entirely aerial. The dark paradox here is that drone killings are sustained by a deeply technophiliac and militarised myth of total vertical vision and a fetish for seeing all. This, however, is combined with an almost complete absence of knowledge of, and media coverage about, those on the ground unlucky enough to get in the way of the Hellfire missiles fired down from the sky. It is known that in Northern Pakistan the mysterious machines flying far above have entered local folklore: the term “”I will drone you” has even entered day-to-day conversation as a morbid joke. Research efforts are also starting to reveal the impacts of drone strikes on the people and communities below. Like the artists behind #NotABugSplat, Stanford University’s Living Under Drones project has recently challenged the dominant narratives surrounding drone strikes. Stanford’s ‘Living Under Drones’ researchers, meanwhile, have shown that civilians in Pakistan and Afghanistan are reluctant to help those hit by the first strikes because rescuers themselves have often been killed by follow-on drone strikes. Injured relatives in the rubble of the first strike have been known to tell their relatives not to help rescue them because of the frequency of these so-called ‘double-tap’ strikes. People also avoid gathering in groups in visible places. Many children are permanently kept indoors and often no longer go to school. Other children struggle with permanent disabilities caused by drone strikes; many amputees have to use poor quality prosthetic limbs. One example is Sadaullah Wazir, a teenager and former student from the village of Machi Khel in Mir Ali, North Waziristan. He lost both of his legs and one of his eyes in a September 2009 drone strike on his grandfather’s home. Rather than being the result of all-seeing sensors that can identify armed insurgents execute them with precision, the realities of drone warfare reveal a dangerous absence of knowledge about the people targeted far below. Canadian anthropologist Gastón Gordillo points out that large-scale civilian deaths are an inevitable result of a U.S. policy of deploying lethal drones , especially when backed up by myths that drone operators benefit from God-like omniscience. These, he points out, stem from widespread attitudes in the military of the way drones and other digital technologies bring with them ‘total information awareness’, ‘persistent surveillance’. Despite their CCTV cameras, heat sensors, motion-detecting systems and other sensors, however, Gordillo stresses that the sheer mass of imagery and data often means that drone controllers are completely overloaded with too much material to process or interpret when taking decisions to fire. In 2009 alone, U.S. drones collected the equivalent of 24 years’ worth of video footage; DARPA’s Argus system, mentioned already, can generate 8 years’ worth of continuous video from a single day’s operations. In addition, the sheer immensity of the huge and foreign geographies that drone pilots target, moreover, mean that drone pilots are almost entirely ignorant culturally of those that they target and kill. Crucially, they have absolutely no way of reliably distinguishing genuine armed insurgent from the rest of the surrounding population. Because of this, they work hard wilfully to fill completely unreliable visual clues – people holding objects or ‘loitering’ suspiciously — with the imagined and violent intent necessary for them to launch their missiles under standard rules of engagement. The sheer immensity of the huge and foreign geographies that drone pilots target, moreover, mean that drone pilots are almost entirely ignorant culturally of those that they target and kill. Transcripts of the conversations of drone pilots repeatedly show their desperation to use Orientalist cliché. This imperialist apparatus of knowledge can turn any aspects of normal, civilian life into clear evidence that they are watching ‘insurgents’ or ‘terrorists’ that can be fired on at will. The language of drone operators effectively enrolls all adult men in the vicinity of drone strikes as ‘combatants’ by labelling them “military age males”. Even the US military has admitted that such a terminology encourages drone strikes against civilians because it “implies that the individuals are armed forces and therefore legitimate targets.” As a result, the US does not count dead adult men as ‘civilians’ unless there is clear posthumous intelligence proving that they are. Constant effort is also made to assimilate other Afghans, Pakistanis or Iraqis on the screens into the set of legitimate targets. Obvious evidence that images of innocent children or civilians are filling their screens is often wilfully ignored or –worse still — interpreted as further evidence of malevolence because assumptions are made that they have been deliberately placed there by ‘terrorists’ or ‘insurgents’ to purposefully thwart drone pilots’ ability to kill. 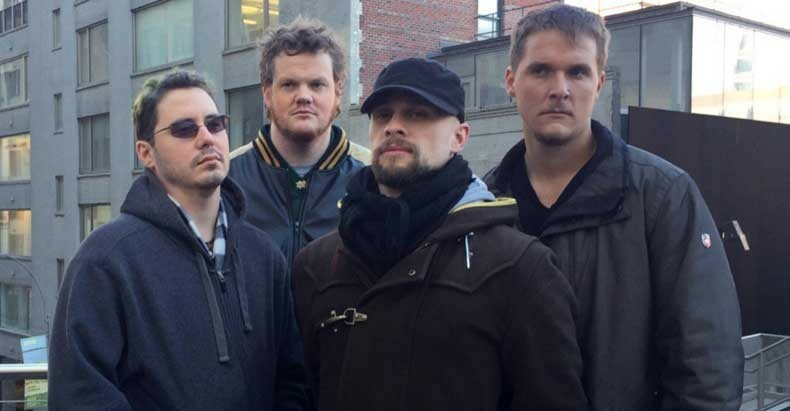 The Drone Four: Michael Haas, Brandon Bryant, Cian Westmoreland and Stephen Lewis. In November 2015, in response to such whistle blowing, the U.S. Government seized Hass’s credit cards and froze his bank account, a treatment they also meted out to several of his colleagues. Grégoire Chamayou’s analysis, of one three hour long surveillance and attack operation on a convoy of three of SUVs that killed civilians in Afghanistan in February 2010, shows a typical, if notorious, case. Throughout the operation there is a sense of the drone controllers’ desperation to destroy the people and destroy the vehicles — whatever the evidence of their clearly civilian nature. The transcript is full of statements like “that truck would make a beautiful target”; “Oh, sweet target!”; “the men appear to be moving tactically”; and “They’re going to do something nefarious”. The mission controller later spots an “adolescent near the rear of the SUV”. “Well”, the operator responds, “teenagers can fight!“ … “ twelve or 13 years old with a weapon is [sic.] 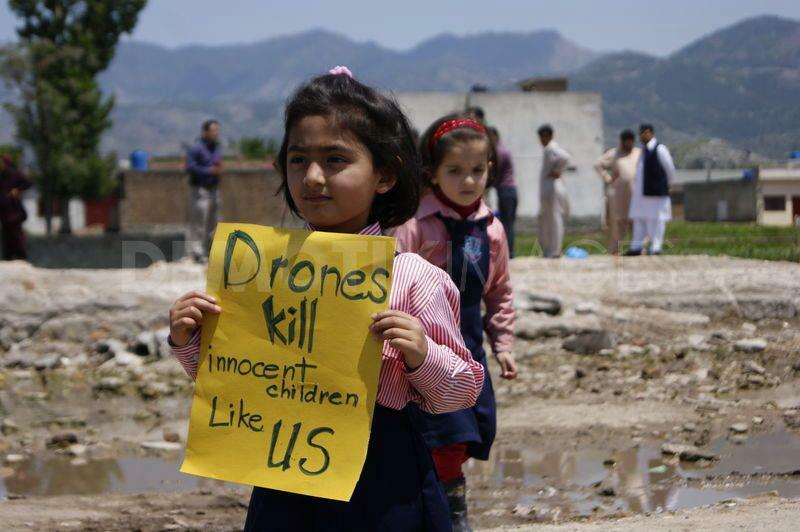 just as dangerous!”” (Children are often called “fun-size terrorists” by drone operators). Based on an alleged ‘weapon’ sighting, the decision is then made to fire Hellfire missiles from nearby armed helicopters called to the scene; the first and third vehicles in the convoy are destroyed. The Predator pilots immediately fly in to assess the carnage. Seeing a scene of dead and maimed men, women and children, the safety observer remarks “No way to tell, man”. The camera operator agreed. “No way to tell from here”. U.S. military officials admitted that on this occasion the missiles killed 16 civilian men and severely injured a woman and three children. However, Afghan elders from the victims’ home villages said in later interviews that the attacks had killed 23 including two boys, Daoud, 3, and Murtaza, 4. As is common in such cases, the US military compensated families of the dead with the equivalent of $4,800 for the relatives of each person killed. Each survivor was given $2,900. In such a context, he stresses that the enormous pressure on drone pilots to interpret what they see as ‘insurgent activity’, combined with the fact that drone operators have no reliable way of distinguishing civilians from ‘insurgents’, means that the killing of large numbers of civilians is in no way an ‘accident’ or an ‘error’. The acts of watching the grainy video feed from the drone, and of launching a missile on humans below, creates a sense of extraordinary power amongst drone operators. One admits that he sometimes felt “like a God hurling thunderbolts from afar’. Another relates that ‘you see a lot of detail … we feel it, maybe not to the same degree [as] if we were actually there, but it affects us.’ ‘When you let a missile go,’ he continues, ‘you know that’s real life there’s no reset button’. There are even some reports of drone pilots struggling with post traumatic stress disorder after they have killed civilians, especially children. Unlike bomber pilots, moreover, drone operators linger long after the explosives strike and see its effects on human bodies in stark detail. As Western military budgets shrivel, a concerted drive is being made by a complex constellation of lobby groups, arms manufacturer and industry associations to construct drones developed initially for war and vertical killing as a panacea for all manner of security and police operations in civilian airspace within domestic ‘homelands’. Many barriers confront such efforts, however. Their murderous use in Asia and the Middle East means that drones have something of an image problem. Civilian airspace regulators are also concerned about the potential for drones to cause widely fatalities through ground crashes or collisions with civilian aircraft. 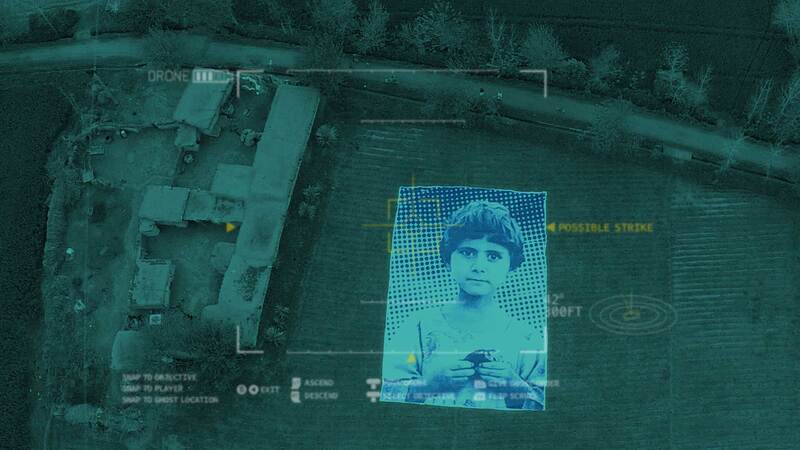 Civil liberties and anti-surveillance lobbyists, finally, are working hard to expose the ways in which domestic drone programmes are umbilically connected to deepening cultures of surveillance and police militarisation. Drone manufacturers, as might be expected, are adamant that their products have been unfairly maligned, and that they can be extremely useful for a wide range of civilian applications. Included here are humanitarian and disaster response, mail delivery, crop monitoring, weather forecasting, search and rescue, and policing. The figure of the drone has even been projected as a much-maligned victim of public misunderstanding based on the widespread myths that drone killings along the ‘war on terror’s’ frontier and war zones are already entirely autonomous. It is crucial to stress that the current shift towards the domestic deployment of drones is a result of the growing militarisation of security within Western nations that have occurred as a key element of the ‘war on terror’. In particular, the widening adoption of the concept of ‘Homeland Security’. The concept originated with the lockdown of Israel in the 1990s; it was honed in the US after the terrorist attacks there in 2001; and it is now being diffused to Europe and elsewhere. Homeland security projects all aspects of civilian life as domains of permanent existential threat requiring militarised responses based on extending the powers of networked surveillance and targeting. In the process, everything beyond the worlds of full weapon-on-weapon warfare becomes a ‘low intensity operation’ or ‘Military Operations Other Than War’ (or ‘MOOTW’ to its friends) within an all-encompassing ‘battlespace.’ Such shifts work to radically blur already vague distinctions between policing, intelligence and military deployment and between local, national and international policy. They also blur the legal and doctrinal separation between the domestic and foreign spheres. Reinforced by such ideas, security operations everywhere increasingly merge into a permanent mobilisation, based on the deployment of high-tech military sensors such as drones, aimed at pre-emptively highlighting threats and ‘targets’ from the background civilian population or city. Crucially, such ideas are fuelled by the same fantasies of total vision against vague and existential threats lurking deep within the normal flows and circuits of civilian life. Such shifts mean that domestic domains dominated previously by a rhetoric of policing against criminal activities amongst citizens are gradually reconstituted as paramilitarised ‘wars’ against lurking, existential threats. In a powerful example, the US Department of Security now routinely project the US-Mexico border in the same language that the US military uses to describe its war zones: a limitless ‘battlespace’ encompassing a world where civilian life camouflages ‘targets’ and where drones and other high-tech surveillance systems are the key to “persistent situational awareness” achieved through “network-centric” operations. The Department of Homeland Security, meanwhile, are already exploring ways of arming its Predator B drones with what it calls “non-lethal weapons designed to immobilize” targets. Fueled by xenophobic and bellicose political rhetoric, the latest US legislation on border security — the ‘Secure Our Borders First Act’ (introduced in January 2015) — added an additional $10 billion for further drone acquisition and deployment. The act calls for the US Department of Homeland Security to use new technologies such as drones to ‘seal’ what is deemed to be an unacceptably leaky frontier. The language is highly militarised: the challenge is to work towards 100% “defence in depth” through radically improved “situational awareness”. This, the argument goes, is necessary so that 9 out of 10 migrants can be intercepted within a 100 mile strip of territory just inside the US-Mexico Border. Again, despite evidence that drones have been an extremely expensive and highly ineffective means of securing the US-Mexico border, myths of total vision and absolute panopticism permeate the politics of drone deployment. Already, the Department of Homeland Security’s Predator drones capture video of the border zones that they monitor which is analysed to automatically identify changes in the terrain below. What the New York Times’ James Risen has termed the ‘homeland-industrial security’ complex, of course, is only too happy to amplify the militarisation of discourses about the security of civilian life, and feed the myths of total vision, in the hope that their weapon systems can reach widespread civilian deployment. This is especially so as drone markets are predicted to triple in value between 2015 and 2025, totalling $93 billion over that period. Global drone manufactures also work hard to lobby US and European Governments to get them to undermine barriers to the widespread civilian deployment of drones. In the US, a 60-strong lobby group of immigration hardliners and conservative ‘hawks’ has established the Congressional Caucus on Unmanned Systems (CCUS). 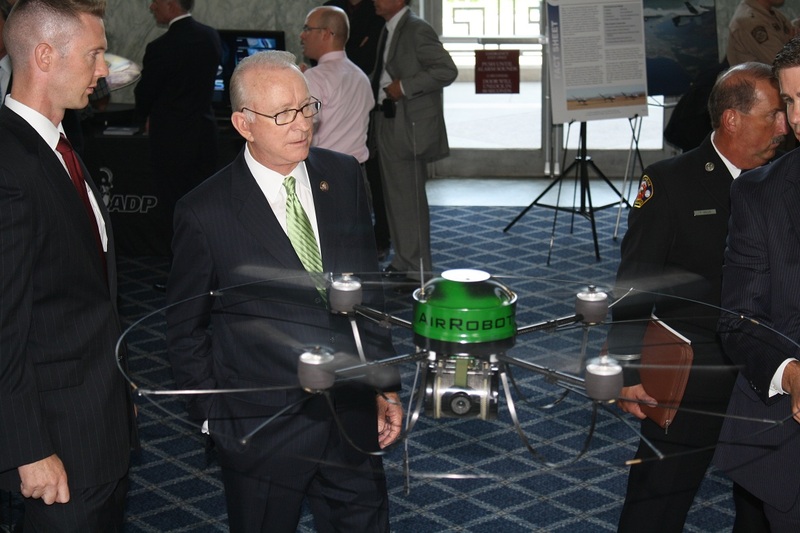 The purported aim of the group is to “educate members of Congress and the public on the strategic, tactical, and scientific value of unmanned systems; actively support further development and acquisition of more systems, and to more effectively engage the civilian aviation community on unmanned system use and safety.” In addition, the main industry lobby group in the US, the Association for Unmanned Vehicle Systems International, spent at least $22 million on lobbying in 2011 alone. 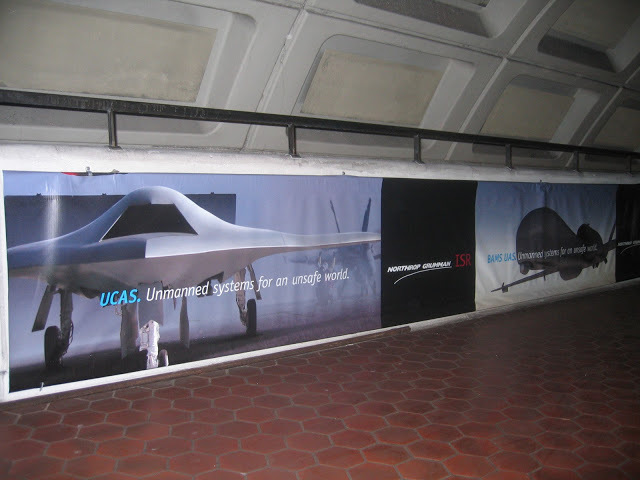 Securitised subway: Billboards for Northrop Grumman X47B strategic strike drone (left) and Global Hawk surveillance drone (right) in a Washington DC subway station. The power of the lobbying of drone companies is especially startling to anyone who uses Washington DC’s futuristic metro system. The walls of the stations are a veritable Jane’s Defence Weekly plastered with huge ads for high-tech drones and other weapons. In flagrant attempts to curry favour with key decision makers in the Beltway, stations have been reconstructed as an extraordinary symbol of the militarisation of US culture and politics. The usual myths of ‘precision’ and perfect vision are again the mainstay here: drone technology is projected as a flexible panacea to all security and military challenges, at home and abroad. Other lobbying efforts in the US and Europe are working to normalise drone use within civilian police forces. In the US the Departments of Justice and Homeland Security have established grants, training programs and “centers of excellence” to support the introduction of drones in policing. Early drone policing activities, to bolster the surveillance capabilities of narcotics squads and S.W.A.T. teams, have already been established in Montgomery County and Arlington, Texas and in Miami. In Europe, meanwhile, a powerful consensus between EU policy makers and defence manufacturers are similarly bent on selling drones as panaceas for domestic security policies. Statewatch and TNI have calculated that the EU has spent fully 500 million Euros, without democratic oversight or public scrutiny, to support such a shift since the late 1990s. Once again, drone manufacturers are pressing hard for civilian expenditure to naturalise drone use within a wide spectrum of civilian applications. A key motivation in Europe is industrial policy: to bolster the growth of European drone makers in a market totally dominated at by US and Israeli companies. Another key focus is Europe’s burgeoning migration crisis, as millions of African and Middle Eastern migrants and refugees risk all making sea and land crossings to flee poverty and war. In October 2010, Dani Stroli of Israel Aerospace Industries made a presentation to one of the EU’s drone policy consortia (of which he was a member at the time). The challenge, he said, was to discover ways to “make people perceive [drone] technology as a natural part of future society”; to “create positive interest in [drones]”; and to “create a multidisciplinary promotional campaign”. The UK lobby group for the drone industries have also suggested that adverts for drones should depict their work in humanitarian emergencies. They also suggest that civilian drones should be painted in bright colours to distinguish them from their murderous cousins in war zones. The problems with the deployment of drones within domestic space are the same that attend all radical extensions of systems of digital surveillance and tracking at a distance within contemporary cultures of policing – especially those based on re-purposed military systems. A permanent and radical extension of vertical surveillance of entire societies through live-feed cameras, communications surveillance, infra-red monitoring and video analysis will be the inevitable result. Drone-based dragnets that gather the electronic signatures of whole cities’ populations, that are the focus of programmes that feature in the Argus and Gorgon-Stare projects, would very likely emerge as the corner stone of domestic drone policing. The use of sensors to see through walls and roofs is also very likely. Combined with the existence of large databases of individual facial images, communications records, and so on, it is not hard to envisage automated man-hunts. 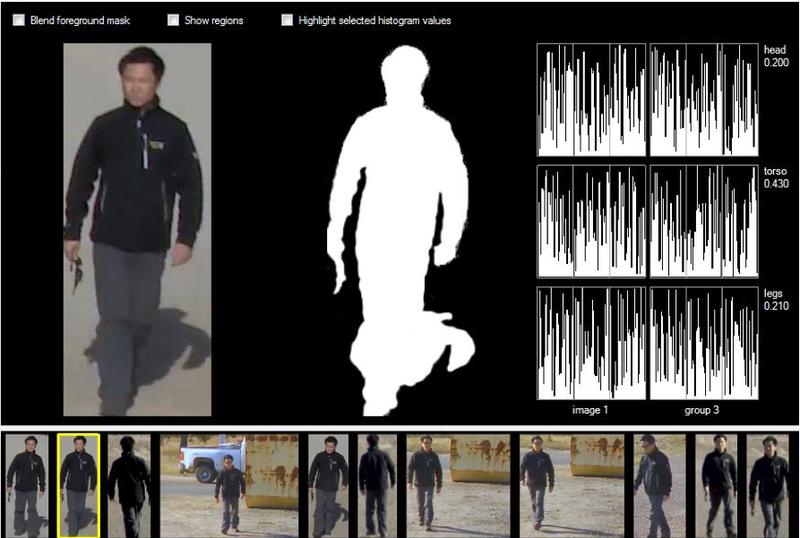 Although face-recognition is in its infancy, and is only as good as the facial images on the databases used, its capabilities are improving rapidly. Working face-recognition drones, trawling images from all manner of high-resolution social media and image and other biometric and information database, would, at a stroke, radically undermine remaining notions of public anonymity on city streets. Again, military drone systems provide a worrying precedent. Tim Faltemier, of the Progeny Systems Corporation, talked in 2011 about a project they’re developing for US army drones that uses 3D models of people’s faces to try and track them biometrically from above. “If this works out, we’ll have the ability to track people persistently across wide areas,” he says. “A guy can go under a bridge or inside a house. But when he comes out, we’ll know it was the same guy that went in,” he continued. In such ‘non-cooperative’ tracking of people by their biometric signatures, the upturned face of the human beneath the drone, rather than a means of challenging the eye of the drone, as in the NotaBugSplat project, becomes, instead, the very signature that allows the drone to deepen its hold. It is very likely that new drone-based policing methods, of course, would be particularly concentrated on intensifying vertical scrutiny of those places or populations deemed, a priori, to be the source of threats, agitation, otherness and criminality. 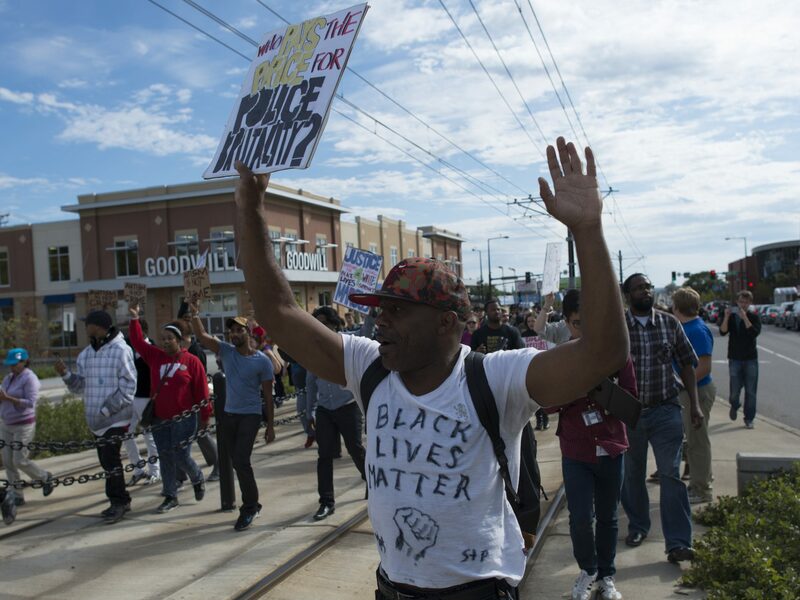 In the U.S., as with the deployment of police helicopters after the widespread rioting in US cities in the late 60s, it seems highly likely that, within increasingly polarised cities, police drone squadrons will overwhelmingly be used to police black and non-white neighbourhoods whilst working to protect and secure downtowns and affluent white suburbs. Focusing on political movements in the vein of the Occupy protests, which aim to interrupt the logistical flows of city life, will likely be another important focus. Just as in the deployment of lethal drones abroad, the use of police drones will rely on the internal prejudices of policing cultures in stipulating what or who is an ’enemy’ in a world where such prejudices are used to simplify the radical complexity and opaqueness of the world viewed below. Finally, once established, regular drone patrols might inevitably be the source of mission-creep, as more and better sensors and weapons become available to be added to existing, highly expensive, platforms.Indeed, in the U.S., the Bill of Rights Defense Committee has already stressed that the domestic deployment of armed drones, building on the Department of Homeland Security’s efforts to arm its border drones, is a very real possibility. “Drones are easily affixed with lethal and ‘less-lethal’ weapons,” they point out. “And assurances that they will not be armed domestically lack credibility.”Already, the Committee cite an example in Houston where police have deployed a small 50lb helicopter drone capable of being armed with a 12-gauge shotgun and a grenade launcher. The local sheriff, moreover, is “open to the idea of adding non-lethal weapons like tear gas, rubber bullets or Taser-style rounds to the drone.”The prospect of armed drones in domestic policing, accompanied in the US by highly racialised and militarised policing tactics, inspires particularly grave concerns. They also bring the prospect of an especially powerful Foucauldian boomerang: the use of high-tech drones piloted from a distant place to deploy violence against racialised ‘Others’ far below both at home and abroad. How, then, to contest the dronesphere? A widespread and powerful range of loosely-coordinated social movements, legal and human rights movements, demonstrations and activism campaigns are working hard at many scales to challenge the progressive normalisation of drones at home and abroad. The Not a Bug Splat project is only one particularly visual campaign amongst many. Resistance to drone-killing is manifest in continuous demonstrations by veterans and other protestors at Creech and other drone air bases; widespread demonstrations against all aspects of the drone-related military machine; forensic analysis of drone strikes to try and hold those perpetrating human rights abuses or war crimes to account; and a wide spectrum of legal, communication and journalistic critiques and challenges. The latter are focusing especially on proscribing the deployment and design of fully automated drone and robot weapons systems where the decision to kill is actually taken by computer software without any human intervention whatsover. An anonymous group of activists have also produced a ‘Drone Survival Guide’ – a guide to ‘21st century birdwatching’ as they call it, outlining types of drones, as viewed from below, as well as ways to challenge their power. “Our ancestors could spot natural predators from afar by their silhouettes”, it reads. “are we equally aware of the predators in the present day?”. A paradox emerges here: more and more of electronic game culture is filled with cases of participants undertaking virtual drone strikes as entertainment. And yet mainstream media providers like Apple too often work to censor or sanitise the bloody and real effects of real drone strikes on real people. U.S. artist Josh Begley tried to get Apple to accept his Drones+ smart phone app which would notify users each time a U.S. drone strike was reported. Beyond Begley, a wide range of journalists, artists, activists and academics are working to render the real effects of civilian drone killings visible in an effort to bring those responsible for such killings to account. 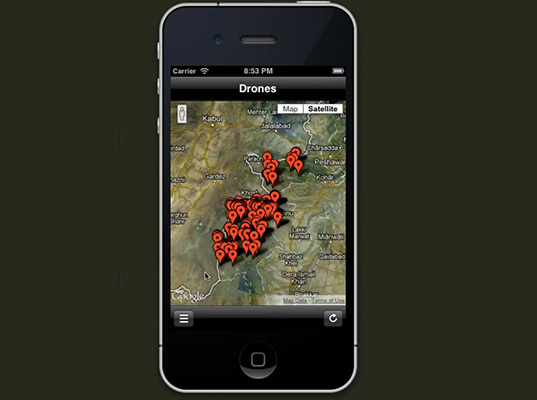 These include the Bureau of Investigative Journalism, the Stanford and NYU law schools ‘Living under Drones’ project, and the #NotaBugSplat groups, James Bridle’s Dronestagram project, for example – http://www.instagram.com/dronestagram – lists satellite images of drone strike locations with their civilian casualties. The invisibility of civilian killings by drones makes forensic analysis of the impacts of drone strikes by critical architects and lawyers especially important. Such experts are helping the United Nations Human Rights Council and other NGOs and legal teams to investigate drone killings of civilians as human rights abuses and potential as war crimes – and to prosecute their perpetrators. In partnership with civilian drone victims, Weizman’s groups are using the latest techniques of computer visualisation and satellite analysis to undertake forensic analysis of specific drone killings of civilians. In the process, they are exposing systemic evidence of acts against international humanitarian law. Importantly, anti-drone campaigns groups and campaigns are working especially hard to problematise the ways in which unarmed and armed drones are crossing over from the colonial frontier to the domestic metropolis. 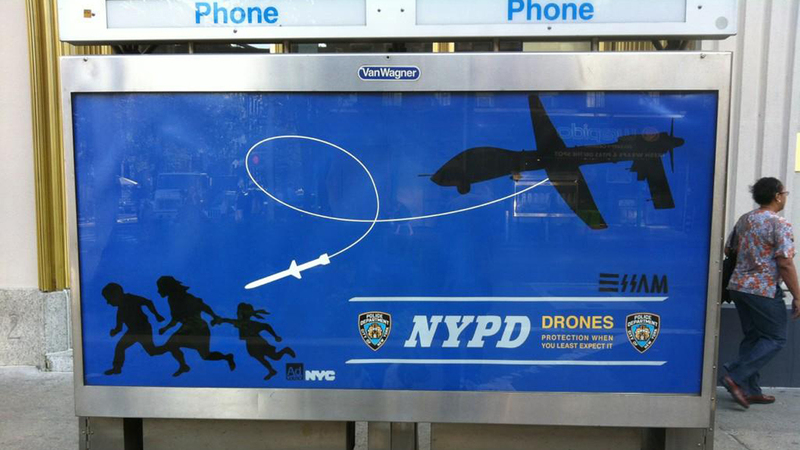 In 2012, in a famous case, the New York based artists Essam Attia was arrested for pasting 100 satirical posters around the city attacking the prospect of drone-based policing there. Triggered by the decision of the New York Police Department to authorise drone use, Attia’s simple aim, he said, was to “create a conversation” about the politics of drone-based policing. Elsewhere, activists themselves are exploring the adoption of drone-base systems to extend their own powers of surveillance ‘from the grassroots’ against state and corporate power (what has been termed ‘sous-surveillance’). This is part of a broader shift in urban activism towards recognising the need to address the volumes of city spaces rather than merely occupying the flat levels of urban streets. With drone hobbyism growing rapidly, and basic drones with video cameras now accessible from any toy store for very low prices, prospects for democratising the drone are starting to emerge. Might drones be repositioned away from the monopolistic control of the worlds of high tech military and police power towards the routines of citizen activism, research, critique and hobbyism? 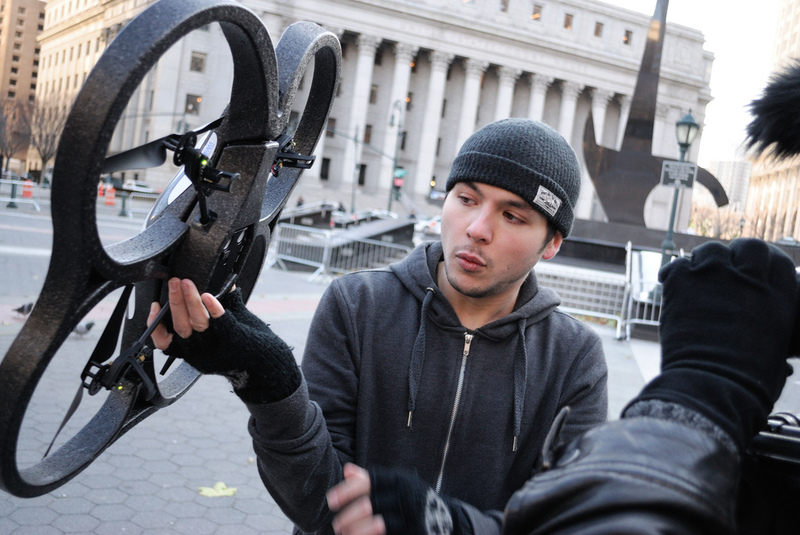 In an initial example, Occupy protestors in New York in December 2011 repurposed a simple drone bought from a toy store as an ‘Occucopter.’ An attempt to distribute the vertical gaze beyond the security forces or corporate media to the activist and demonstrators themselves – and their channels of communication — the Occucopter represents one example of the ways in which the democratisation of initially military technologies can be used to challenge the militarisation of civil society. In practice, the Occucopter helped activists become aware when groups of demonstrators were being illegally incarcerated, when they were being geographically confined by ‘kettling’ tactics, or when journalists were illegally barred from accessing sites of demonstrations. Recorded footage from the drone was also useful in countering the efforts of the police or corporate media to brand activists and demonstrators as a mere gang of ‘anarchists’. (Further successful drone use by protestors and critical researchers has occurred in Estonia, Russia and Poland and Washington D.C.). Capturing the violence of political regimes against non-violent protestors, in particular, can be a huge boon in efforts to bolster campaigns whilst quickly undermining the legitimacy of those in power. Technology researcher Patrick Meier even wonders whether drones could be used more strategically to paint entire skies with key activist slogans or to follow key public officials during protests. The first challenge for such campaigns, however, is to prevent the a priori criminalisation of activist drones at the outset. Just as citizen drone use is proliferating, national security states are trying to reclaim their hegemony of the skies. As journalists, activists and researchers have extended their use of the technology to gain previously impossible footage and imagery of proscribed and securitised spaces, so civilian use of such technologies is increasingly being criminalised as a ‘security threat’. In 2015, three Al Jazeera journalists were arrested on suspicion of using drones without a license in Paris; a photojournalist using a drone near Gatwick airport was also arrested and held even though he had a license. Many states are also introducing much tighter legislation criminalising the use of hobbyist drones based on the same vague and ill-specified ‘security’ concerns so often used to justify homeland deployment of drones in the first place. With particular irony, scare stories are often used in such arguments about the possibility of terrorists using drones with weapons attached. In February 2015, four weeks before a hobbyist drone controller was arrested for accidentally flying his machine whilst drunk above the White House, a wide range of US state security departments had held a ‘summit’ exploring the dangers posed by the possible weaponisation of hobby drones. Videos of fighters in the Syrian civil war using drones equipped with automatic weapons were shown. An exhibition was organised of hobby drones with various weapons attached. The emphasis was that the enormous expenditure fortifying government facilities against surface-level terrorist attacks might ultimately be simply traversed by those using the third, vertical, dimension. More prosaically, police forces in Japan unveiled an anti-hobbyist drone in December 2015. This is equipped with a net to pluck drones seen as troublesome out of the Tokyo skies. Such cat and mouse, drone versus drone, conflicts will only become more intense in the airspaces above cities. Fuelled by the language of emergency and endless war, combined powerfully with a major push by military and security complexes to normalise their deployment, fleets of unmanned drones are quickly saturating our skies. Myths of ‘precision’ cover their murderous trail; powerful censorship and intimidation obscures their violence; efforts to sanitise or infantilise such systems hide their domestic proliferation. With an on-going shift towards fully automated drones at home and abroad, which identify ‘targets’ or ‘abnormal’ activities entirely autonomously using software, the challenges facing those who oppose the robot imperium are large indeed. Such shifts, however, are not inevitable. The challenge now is for concerted efforts to connect and mobilise critiques, activism, protest and legal mobilisation so that the burgeoning world of lethal and ‘less than lethal’ drones can be revealed, regulated and radically circumscribed.